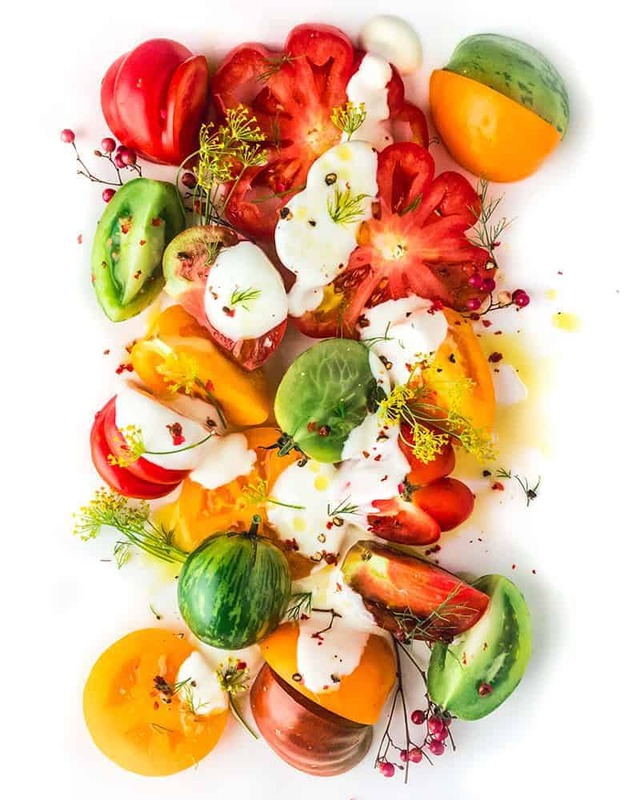 We like to dress up our tomato salad with a little savory yogurt dressing and a whole lot of dill, an exquisite and delicious combo we learned from long-time contributor Kathleen Korb (@kathleenkorb) back when we built a recipe app for the iPad (2013). 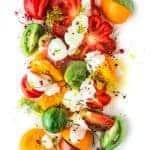 Cold tomatoes are a welcome contrast to those usually served (at room temperature) in a salad, so we chill them on a plate in the fridge before finishing the salad with dressing and herbs. We used a variety of different types of tomatoes for the photo above, but it’s fine to use whatever you have on hand, even if its just one type of tomato. Slice the largest tomatoes and cut the smaller ones into wedges. Arrange the tomatoes on the plate/platter you are going to serve them on and place in the refrigerator for at least 30 minutes before serving. Stir all the yogurt ingredients except the salt and milk together in a small bowl. This is really an ad-lib recipe for dressing, and you can adjust the flavor to however you like but be sure to finish by adding salt to taste. Because you want to be able to spoon the dressing loosely over the salad, add milk, a tablespoon at a time, and stir together to thin out the dressing so it is more loose than thick. Just before serving, take the tomatoes out of the fridge. If you haven’t arranged them yet, give your plate/platter a few good shakes and the tomatoes will fall nicely into place. Spoon a couple splashes of the dressing over the tomatoes until you’ve covered maybe 1/4 of the salad (you can pass the dressing in a bowl at the table). Add the dill and peppercorns, artfully or randomly 😉 sprinkling them over the salad. Grab a big pinch of Maldon sea salt and sprinkle all over. Lastly, give the whole salad a short drizzle of the olive oil and then serve immediately.